Chicago duo Kidz in the Hall is kicking off a tour later this month to support its forthcoming third album, Land of Make Believe. 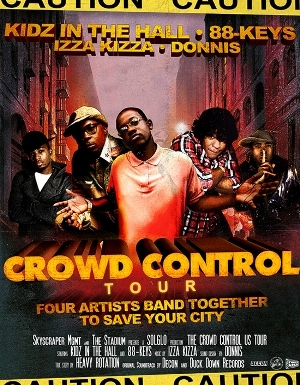 Dubbed the “Crowd Control Tour,” the run also features 88-Keys, Izza Kizza and “Atlanta brave” Donnis. This entry was posted in News and tagged Kidz in the Hall. Bookmark the permalink.